What do you do when you’ve helped a small technology company achieve greater inbound success in a short period of time? Help that company take their marketing efforts and thought leadership to the next level! Here’s a story about how SmartBug helped a client produce content that made waves in its industry, achieve stunning conversion numbers, and win a prestigious MarCom Award along the way. CVM Solutions is the premier provider of supplier diversity platforms and data to large organizations. Supplier diversity drives innovation, economic growth, competition, and companies’ all-important bottom lines. CVM offers solutions that allow organizations to evaluate their supplier diversity programs and connect with new diverse suppliers. When we first partnered with CVM in late 2015, CVM faced the marketing challenges we see with many of our clients: Its website wasn’t attracting enough visitors, and the visitors who were arriving weren’t converting into leads. The solutions SmartBug proposed to fix CVM’s challenges were straightforward, but the impact our ideas delivered were dramatic. Within 15 months of our retainer, CVM’s organic traffic more than doubled. Contacts increased 700 percent, and CTA conversions also saw a massive jump. At the beginning of 2017, CVM was ready to take its marketing to the next level and wanted to create something that would have a large impact in the industry. 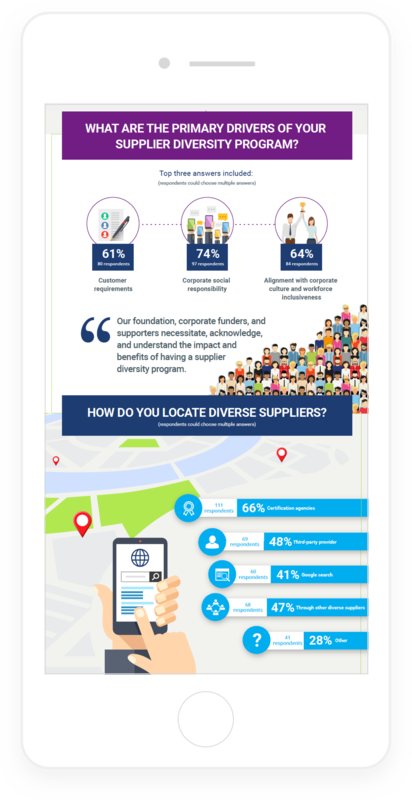 The State of Supplier Diversity reports have cemented CVM Solutions as a thought leader in the industry. SmartBug helped us achieve our vision for this original research, from ideation to completion." Within 15 months of our retainer, CVM’s organic traffic more than doubled. Contacts increased 700 percent, and CTA conversions also saw a massive jump. CVM was ready to take its marketing to the next level, and the result was the 2017 State of Supplier Diversity reports—two surveys that examined the state of the industry from the points of view of supplier diversity professionals and diverse suppliers. SmartBug Inbound Marketing Strategists Jessica Vionas-Singer and Kristen Patel and CVM Marketing Manager John Suarez worked together and came up with the idea of conducting original research to examine the state of the industry from the points of view of supplier diversity professionals and diverse suppliers. In February 2017, the surveys, promoted on the CVM website and through email marketing, were made available and drew an impressive 422 respondents. The wealth of data produced was immense, as one can imagine, given 34 questions split between two surveys and more than 400 responses. The challenge would now be to take all of the data and produce something that was easily digestible and impactful. After careful analysis of the data by the strategists, SmartBug Senior Copywriter Joe Gillespie took the results and wrote two comprehensive documents: the 2017 State of Supplier Diversity reports. Yet that was only one piece of the puzzle, as we didn’t want the reports to be a dry data dump of black and white charts that would put the reader to sleep. SmartBug Designer Andy Williams was up to the challenge and started by creating a concept spread for Suarez to review. 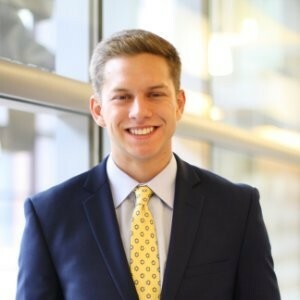 Once the direction was locked in, Williams went to work creating 49 double-page spreads in the two reports utilizing a variety of chart types, pull-out quotes, illustrations, and highlighted statistics. Sticking to CVM’s color palette of lime green, navy blue, cyan, and purple, the finished result was vibrant and, although packed full of data and statistics, easy to consume and process. And the campaign didn’t stop there! SmartBug created two infographics highlighting some of the key findings of each report for publication on CVM’s blog with calls to action (CTAs) to download the full reports. We also leveraged the research into multiple blog posts, again pointing to the full reports. Both reports were published as gated content on the CVM website in July 2017 and were immediate hits. Approximately 300 people downloaded the reports in the first month, a number that has since grown to more than 1,000. To maximize the impact of the research on an ongoing basis, SmartBug added CTAs to download the reports on CVM’s most popular blog post, What Is Supplier Diversity and Why Is It Important?, which consistently generates more than 1,000 organic views a month. These CTAs perform at 5 percent versus the typical 1-2 percent most marketers are used to seeing. The content’s landing page converts at an impressive 42 percent. Considering that the average e-book converts at 5-15 percent, CVM’s reports have far surpassed expectations. Also, the new contact rate from the reports is an incredible 17.6 percent. Furthermore, a lead nurture workflow was implemented to help nurture these new contacts down the funnel, with a goal of becoming an SQL. This workflow got a 5.2 percent performance rate, which is impressive given the high bar for success (versus many lead nurtures, which have a goal of just moving to the next stage, for example). Given this success and the impact CVM was making in the supplier diversity community, SmartBug submitted the campaign to the prestigious MarCom Awards and was honored as a Gold Winner—one of 36 MarCom awards we won in 2017. Finally, the accolades CVM received for the reports from others in the supplier diversity industry were significant. Thought leadership was a goal of the reports—and this goal was definitely achieved. SmartBug and CVM followed up the 2017 State of Supplier Diversity reports with a 2018 version, which drew 542 responses, 28.4 percent more than the year before. With our help, CVM is attracting customers and establishing itself as an authority in supplier diversity.